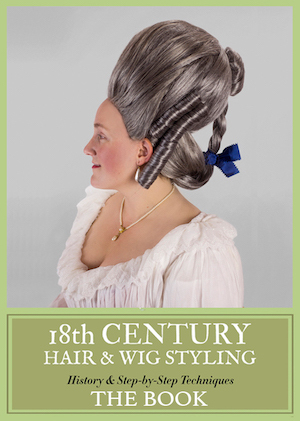 Pop music videos and 18th-century costumes — two great tastes that taste great together! Some of these we’ve shared with you before, but why not wrap them all up together with a bow? Of course we’ve discussed this one, with cameos by Hugh Laurie and John Malkovich and the costumes reused from Dangerous Liaisons (1988). It’s a fabulous song and a classic ‘story’ video trying to make sense of the lyrics, so the historical costumes add to the drama. Except for the towel on Annie’s head — what’s up with that? Nothing to do with the film, but part of that 1980s / 18th-century zeitgeist, this vid’s best feature is Falco as an 18th-century fop kickin’ it with a biker gang. The costumes are nowhere near historically accurate, but it’s a dance tune sung mostly in German, so no biggie. Clearly, we loves us some Adam and the Ants — we analyzed the video and the background materials extensively, what with the mix of 18th-century costume, pirates, military style, and New Wave awesomeness. All hail the dandy highwayman! Specifically, Madge’s performance at the 1990 MTV Video Music Awards, where she borrowed the white francaise Glenn Close wore in Dangerous Liaisons to perform the dance hit. This is my personal anthem, and yes, I know all the moves (you’ll see them on display at any Costume College Gala). Sure, you may remember the song from Marie Antoinette. But this video is a little different … yep, you’ll find all three of the Frock Flicks team, plus two our our sig.others and some of our best pals, all frolicking around Chateau de Pys in southern France! Trystan’s husband filmed and edited the production, which we all contributed to. Are there other 18th-century themed music videos we should be aware of? Your video is fantastic!! Well done! There was some co-ed teeny bopper group in the late 90s (or maybe early 2000s) that did one, but I can’t remember enough to find it. But it was Versaille-ish and they were dancing? 1. The guy with the blonde streaks is the cheesiest thing I have ever seen. 2. Watching women attempt to do the snake in corsets!! Why didn’t Nightwish exist when I was 15? I would have loved them!! This is my nomination! I have no idea what the song is supposed to be about, but it entertains me. I love Rock Me Amadeus so much and Annie Lennox is just the best. Fantastic list! 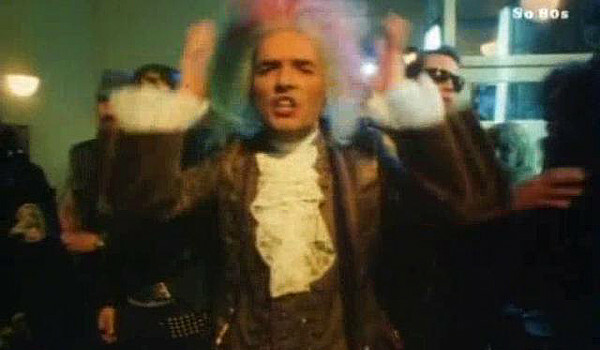 Duran Duran’s Out of My Mind features a lot of Rococo-style clothes by Vivienne Westwood. Sarah McLachlan’s “Stupid” video has an 18th-century sequence at the beginning. Thunderstruck Cover by 2Cellos has some nice stuff. Oh man, that was quite the ride. I hate it when you think you’re gonna get laid and then your hookup starts having wolf heads come out of his chest. So wrong from a musical/white washing perspective. Also, those are not the 18th century uniforms you were looking for…. Hamilton got the basic look right, but these guys decided to go the My Chemical Romance / Hussar look anyways.